The term ‘students‘ mean they are learning and are not done with their course. The standard of economy and demand in the work culture has introduced students to pick internships or part time jobs to add value to their course and also build a reasonable amount of experience before they want to get into the actual job. 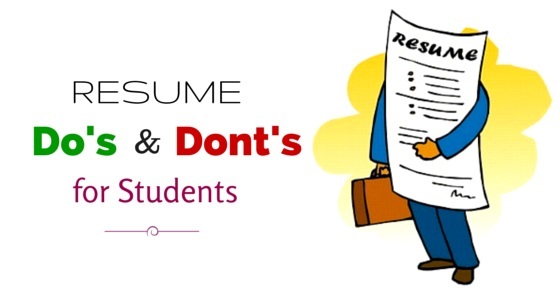 Keeping this in mind, we are about to write what are the dos and don’ts of a student’s resume. A temporary job profile that is mostly related to the student’s present course of studies. This is mainly done to gain experience and to enhance their practical knowledge in the field that they want to excel in. Students here look out for jobs to fulfill their monetary needs or to gain experience or to achieve both. One needs to remember that part time jobs are done which may or may not relate to their course of education. Regardless to the above situation, students need to have certain basic ideology for creating their student resume. Points below are to be kept in mind before penning down a resume. Keep your sub headings, name and important messages in bold/italics. This gives you an insight of how a student can prepare a resume to compete with others and get a job. We here are talking about how to begin constructing a student resume and its body message keeping in mind the above do’s and don’ts. Consider 5 major points before preparing the resume. These are; Contact information, education, experience/ projects handled, assessment results and skills and interests. These act as the major pillars of your resume and the content under these should speak the candidate you are. Use a normal word doc to build your resume (to keep in mind we require only one sheet to prepare a beginners resume). Your contact details such as Name, address, Mob no., Email address should be correctly mentioned with name being in bold. Mention the universities you have been part of previously and currently. Key in the details of the subject you are involved with and highlight the specialization there after. You need to mention the University name and expected year of passing and enrollment year. Here we are not talking about the typical work experience as it is evident we are preparing a beginners resume or a student resume. This term in the context mean any experience that a student holds in terms of additional initiatives, activities, projects handled, worked as an assistant or as a lab coordinator, etc. The knowledge that is acquired through these is something you need to highlight. To support your achievements and statements you can also provide relevant references who can talk about your journey with them. Facts and figures are a must to every student in preparing a correct resume. Remember employers verify your status through various resources. To showcase your promptness and truthfulness, these inputs help talk the person you are. You could also provide a photocopy of your previous assessment cards or certificates as per the employer’s request. Your inbuilt or acquired skills and interests are an important aspect. This proves not only your capabilities but also your urge to follow them. Remember the proper usage of bullet points, borders, font size, font, bold and italicized words or phrases (only if necessary), black color, highlights, etc. Keeping the do’s and don’ts and preparing a student’s resume in the above pattern can be a progressive step towards achieving a job. However, it is also helpful if you could prepare your resume and allow experienced or full time job professionals to proof read your resume before submitting it for job vacancies. This avoids grammatical mistakes, typo errors if any and gives you a clean and simple profile. Many of us fail to build a complete structured resume even after years of job experience. Trends and demands change from time to time so be well aware of them for updating your resume. Here is wishing all the best for students aspiring to get a meaningful job and a right company to support their interests and studies. Keep in mind, this is just a beginning, once you start working every step adds as an experience. Previous articleHow to Prepare for your Annual Performance Review?